Tranche Cellars is the second of three wineries from Michael Corliss, Lauri Darneille, and Kendall Mix. The first was Corliss Estates which had its inaugural release in late 2008. The next will be RMV Cellars which will have its first release next spring. Tranche Cellars is located in the former Nicholas Cole Cellars facility in Walla Walla (NB: Nicholas Cole moved their tasting room downtown and is currently producing their wines at Artifex, a Walla Walla wine services company). Tranche released its first wines earlier this year – a Chardonnay, a Roussanne-Viognier, and a Pinot Gris. The fall releases are the winery’s first reds - a 2004 Red Wine and Cabernet Sauvignon and a 2005 Barbera. In terms of the Red Wine and Cabernet, Tranche’s national sales manager Lars Ryssdal describes these wines as “separated at birth” from their Corliss Estates counterparts (The 2004 Corliss Red Wine and Cabernet will be released next month. See a review of these wines here). Grapes for the Corliss and Tranche wines were separated on the sorting table with the higher quality grapes going to the Corliss wines. After this, the Tranche and Corliss wines traveled separate paths. That is to say, the Tranche wines are not declassified Corliss wines; they were vinified separately. While these wines do have some stylistic similarities, the Corliss wines show more depth, quality, and complexity as you would expect given the significantly higher price point. In the future, Tranche Cellars plans to source fruit from its estate vineyards, focusing on Chardonnay and Rhone varietals. 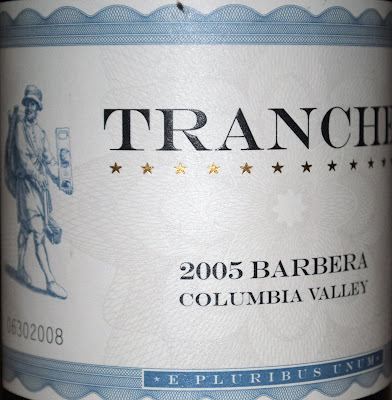 Tranche Cellars Red Wine Columbia Valley 2004 Silky chocolate aromas mix with abundant black licorice, some chocolate, spice, coffee grounds, caramel, and a dash of black pepper. Weighty with aged fruit on the taste along along with licorice, earth, and some alcohol. Carries more completely across the palate compared to the Cabernet. Bottled on 04/03/2007. 14.9% alcohol. Not a particularly big nose that is marked by chocolate covered cherries, coffee grounds, and caramel, along with light herbal notes. A fair amount of alcohol shows at times. Lots of aged fruit on the taste along with soft tannins. A lot of good things going on but the alcohol takes over about ¾ of the way through. Improves after several days being open with a palate coating mouthfeel. Bottled on 04/04/2007. 75% Cabernet; 18% Merlot; 7% Cab Franc. 15.2% alcohol. A deep, intense color. Light, sweet spices float through the air along with anise and a fairly strong herbal quality. Bold on the palate with earth, chocolate, tobacco, and citrus. Silky oak lies underneath the fruit. The alcohol starts to come out of balance as the wine warms up. 15.5% alcohol. Bottled on 6/30/2008.